If possible, set the machine so that just a little tension is put on the thighs when you sit and get into position. Sit and position yourself so that the inner legs are pressing on the pads. Squeeze the legs together until they meet (the left leg component of the machine should gently touch the right leg component of the machine in the center). In a controlled manner, move the legs apart, thereby returning to the starting position. Normally more weight can be used when doing machine adductions than when doing cable adductions, but the range of motion will likely be decreased with machine adductions. Those who are not familiar with adductions, especially machine adductions, can easily be deceived by the relative ease which they are able to do these. However, the next day their legs may very well tell them otherwise - that is, they may find that their legs are far more sore than they expected. 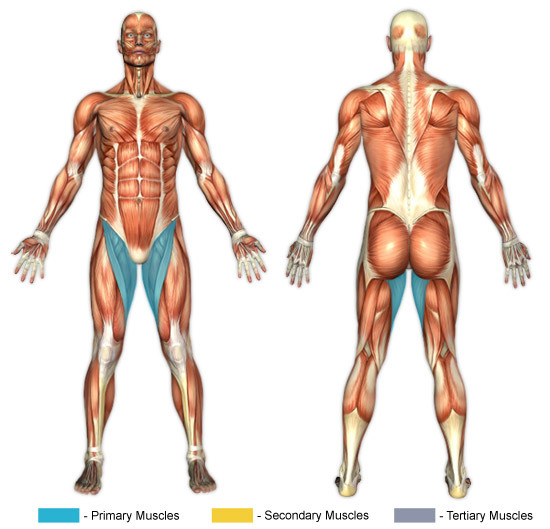 Adductor muscles are particularly susceptible to injury. Therefore, it is recommended that weights are increased gradually and that stretching is done before and after the workout.